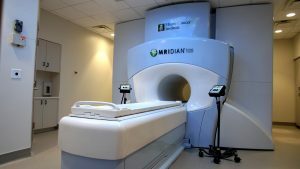 MIAMI, FLA. (May 21, 2018) — Miami Cancer Institute, part of Baptist Health South Florida and the state’s only member of the Memorial Sloan Kettering Cancer Alliance, proudly announced today that it has begun treating patients with MR image-guided radiation therapy with the installation of the ViewRay MRIdian® Linac. Miami Cancer Institute is the second site in the United States to treat patients with this treatment technology, adding to its comprehensive radiation oncology program – the only cancer center in the world to offer each of the latest radiation therapy technologies in one integrated location. The ViewRay MRIdian Linac is the world’s first and only FDA-cleared MR image-guided radiation therapy system. It provides a unique combination of continuous magnetic resonance imaging (MRI) and simultaneous radiation therapy delivery for the treatment of cancer. MRI improves tumor visibility by clearly defining the targeted tumor from the surrounding soft tissue and other critical organs. The ability to see both the tumor and surrounding organs constantly throughout radiation delivery allows physicians to personalize treatment based on changes in the shape or location of the tumor and surrounding tissues using on-table adaptive therapy. As a result, physicians can quickly respond to subtle anatomical changes observed on a daily basis and reshape the dose to better match the current contours of the tumor. Unlike MRI systems used in diagnostic radiology, the MRIdian Linac’s high-definition MR was purpose-built to address specific challenges including beam distortion, skin toxicity, and other safety concerns, which may potentially occur when high magnetic fields interact with radiation beams. MR image-guided radiation therapy is particularly effective in precisely targeting tumors that move with respiratory motion, such as those located in the lung, liver and pancreas. “As the second site nationwide to offer patients the MRIdian Linac, we have the opportunity to improve treatment accuracy, allowing higher radiation dose to be safely delivered to tumors while minimizing overtreatment of normal tissue,” said Michael Chuong, M.D., Radiation Oncologist at Miami Cancer Institute. Miami Cancer Institute’s comprehensive radiation oncology program also includes TrueBeam Linear Accelerators, TomoTherapy, CyberKnife, Gamma Knife, pencil-beam scanning proton therapy, and multiple brachytherapy and radionuclide therapies. The Institute unveiled its state-of-the-art pencil-beam scanning Proton Therapy Center in March 2018 – the first cancer center in the area to offer this form of radiation treatment. To learn more about MR image-guided radiation therapy at Miami Cancer Institute, please call 786.596.2000. For images and b-roll footage of the ViewRay MRIdian Linac system, please visit our Newsroom. Miami Cancer Institute is a destination cancer center known for its leading clinical care, compassionate patient experience, clinical research and state-of-the-art technology – including the first proton therapy center in South Florida, Latin America and the Caribbean, and the only radiation oncology program in the world with each of the latest radiation therapies in one place. The Institute offers a robust roster of prominent physicians established in the community, in addition to renowned cancer experts, clinical researchers and genomic scientists recruited from the nation’s top cancer centers. As Florida’s only member of the Memorial Sloan Kettering (MSK) Cancer Alliance, Miami Cancer Institute is part of a deep and functional collaboration that affords patients access to innovative treatments right here at home and ensures the standards of care developed by our multidisciplinary disease management teams match those at MSK. Heralded nationally as one of the new “hybrid” cancer centers of the future, Miami Cancer Institute represents the next generation of cancer centers in the country, combining well-established, high-quality community-based cancer care with the best of an academic cancer center – offering patients innovative clinical trials tied to research and genomics and the recruitment of disease-specific surgeons, medical oncologists and radiation oncologists who are experts in their fields. For more information, visit MiamiCancerInstitute.com.